The Condor Tactical Leg Holster ismade to fit most pistols, the Condor Tactical Leg Holster stays put when you’re moving fast to carry out your operation. Offering a strong hold and a one-hand snap release, your weapon stays secure until you make the draw. 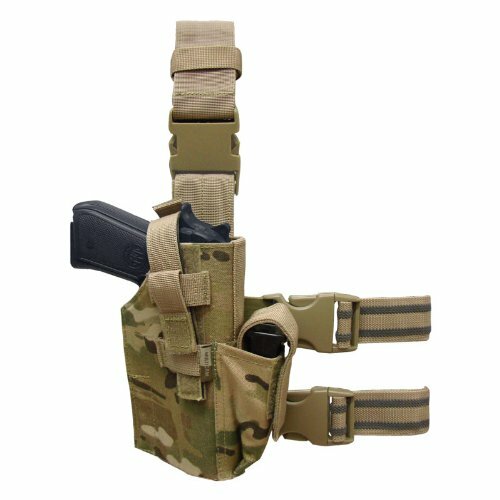 The Condor Tactical Leg Holster is designed to accommodate all medium to large size pistols (G17 to Desert Eagle), and is extremely practical/functional. The straps on our holster are specially treated with Non-Slip material. Also, our retention system is extremely easy to disengage in the heat of battle. But, in order to protect against guns being lost in the heat of battle/on the field, a further optional Velcro safety is added! An extremely function holster. The TLH-008 leg holster is made from a durable 1000 Denier Cordura Nylon fabric and is very stiff. This allows the holster to keep shape so it can accommodate most full-size and sub-compact semi-automatic pistols with ease. Even in a quick-draw situation. The model that I purchased has a genuine Crye Precision Multicam pattern. However, the TLH-008 can be found in Olive Drab, Tan, Black as well. The adjustable retention strap includes plenty of additional hook and loop material to secure most weapons. In addition to the quick-release button strap, there is a locking strap that can be attached when you need the firearm secured, or it can be folded down out of the way to provide quick, one-touch access. There is an adjustable magazine pouch located at the front of the holster that will accommodate most common semi-automatic pistol magazines out there. The holster is held up by a 1-7/8″ webbed strap that can accommodate most belt widths. There are hook and loop adjustments above and below a plastic quick-release buckle providing the wearer a tremendous amount of adjustability. The quick-release buckle allows the wearer to quickly drop the holster. There are also two 1-7/8″ adjustable webbed leg straps featuring anti-slip rubber stitching and plastic quick-release buckles. While all of the adjustments are there to help provide a comfortable fit, for some it can be a daunting task to get it just right. My only complaint is related to a slight rolling motion that the holster makes in certain situations. The strapping behind the holster is thick causing the holster to protrude just a little from the side of your leg. This causes the holster to roll a little when you run. I found it to feel a little annoying, but it did not detract from its ability to keep the firearm secure. Some have claimed that this holster is not really for duty-carry use. There are surely more expensive tactical leg holsters out there that are likely much better. However, I think it will perform just fine for most people in most situations. The durable materials and quality workmanship that Condor has put into this holster is certainly worth the low $25 price tag. For this price, you can hardly go wrong. Condor Outdoor Products, Inc specialize in tactical vest, plate carrier, modular pouches, packs…etc. With over 20 years of experience in the tactical/outdoor gear industry, Condor has established great business relationships with over 1,000 retail dealers throughout the United States and Canada.